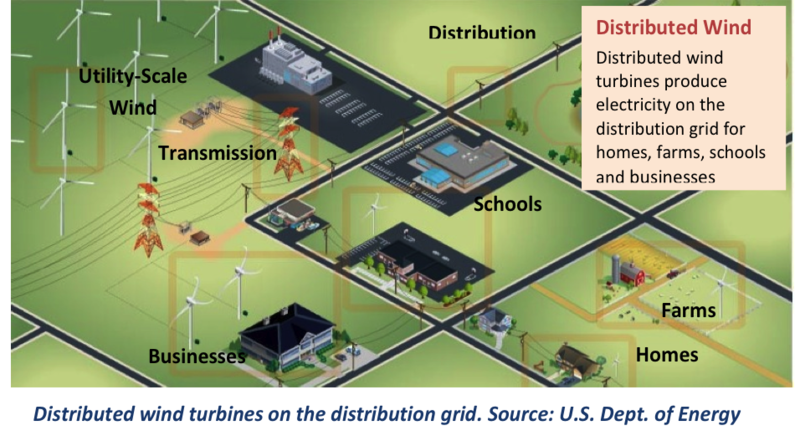 Distributed wind energy systems offer reliable electricity generation in a wide variety of global settings, including households, schools, farms and ranches, businesses, towns, communities and remote locations, as depicted below. Projects range for example from a 1-kilowatt (kW) or smaller off-grid wind turbine at a remote cabin or cell phone tower – to a 10-kW wind turbine at a home, small business, or small agricultural load – to several multi-megawatt (MW) wind turbines at a university campus, manufacturing facility or any large energy user. The sheer number of sites with enough space and a productive wind resource is in the tens of millions, giving distributed wind applications the potential to contribute at the gigawatt scale. Installed primarily where people live and work, distributed wind turbines are often the public’s first exposure to wind energy. Distributed generation (DG) refers to electrical power generation that occurs close to where the power is consumed, independent of the type of power-generating technology. Electricity that is primarily used on site by the system owner is often called “inside-the-fence” or “behind-the-meter” generation. DG systems are typically small by comparison to centralized power plants, but they provide significant benefits including reduced energy loss during transmission and reduced load on utility transmission and distribution lines. In recent years, distributed generation has also become a viable energy alternative regarding national security concerns. Strictly speaking, “distributed wind” refers to any DG wind facility serving local loads. Proximity to end-use: wind turbines installed at or near the point of end-use for the purposes of meeting onsite load or supporting the operation of the local (distribution or micro) grid. Point of interconnection: wind turbines connected on the customer side of the electric meter or directly to the local grid. Distributed wind energy systems are connected either physically or virtually on the customer side of the meter (to serve onsite loads) or directly to the local distribution or micro grid (to support local grid operations or offset nearby loads). This distinction differentiates typically smaller distributed wind systems from power generated at wind farms comprised of dozens or hundreds of multi-MW wind turbines and sent via transmission lines to substations for subsequent distribution to loads. Wind projects up to multiple MW reducing energy costs at or near agricultural, commercial, industrial, and institutional sites and facilities. “Medium” wind turbines having rotor swept area between 201-1,000 square meters (approximately 50 kW up to approximately 500 kW). A wind project’s ownership does not define whether it is distributed wind; however, distributed wind systems are typically owned by a local entity, for example an individual or family, a school district or hospital, a farm or ranch, a local business, a municipality, or a Tribe, that uses most of the electricity on site. Most distributed wind projects as well as some wind farms are community-owned incorporating local financial participation and control. Some distributed wind projects and most wind farms are owned by outside professionals, such as energy investors or wind farm developers, and the electricity is sold either under a leasing arrangement to energy consumers or bulk to a utility. Distributed, locally-owned and community projects typically contribute more to local economic development than conventional wind farms. DWEA was formed specifically to support the needs of smaller-scale wind projects with a significant element of local ownership and electricity use. DWEA’s primary mission is to promote and foster all aspects of the American distributed wind energy industry. The local grid is defined as distribution lines with interconnected electric load(s), typically at a voltage of 34.5 kV or below.